You can have the best dressed kids in the New Year! Enjoy 20% off the entire store when you shop Boxing Week at Carter's OshKosh & Bonnie Togs. This 20% applies to all regular and clearance priced merchandise. Make this Boxing Day Canada 2013 the best yet by getting some awesome prices on clothing for your little ones. OshKosh is definitely my favourite brand. 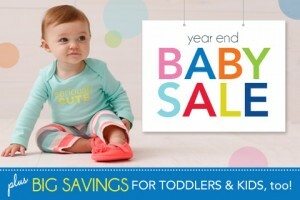 Enjoy Carter's OshKosh and Bonnie Togs Year End Baby Sale this Boxing Day. Shop Boxing Day Online at OshKosh and Carter's here. Shop Boxing Day Online at Bonnie Togs here. Bonnie Togs, OshKosh B'Gosh & Carter's Canada Boxing Day Sale for 2012 is here! 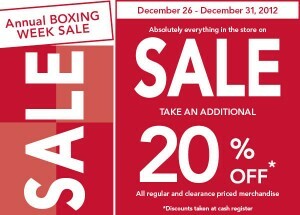 It's actually a Boxing Week sale since it's valid from December 26th till the 31st, 2012. Absolutely everything in the store is on sale. Take an additional 20% off all regular priced merchandise. Discounts will be applied at the cash register.